My mother celebrated a big birthday a few days ago. I won’t say exactly how old she is, mostly because it makes me feel incredibly old myself. 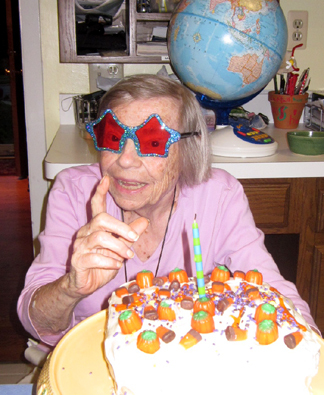 Suffice it to say that she is at an age at which every birthday is a big birthday. We were visiting my brother and his family and faced a couple of requirements for the birthday cake. It had to be relatively small since all of us (except my mother) need to lose a little weight. And it had to be simple. My brother was in the hospital at the time. He is happily and healthily home now, but we didn’t want to make a complicated family time more complicated. I had recently rediscovered my grandmother’s recipe for chocolate cake and decided it might fit the bill. I recalled this cake well from my youth, when it was one of my mother’s standbys for a quick cake. She called it “Mother’s Chocolate Cake” (on my grandmother’s recipe card it is called “My Favorite Chocolate Cake”) and iced it with cream-cheese frosting. The recipe turned out to be a teensy bit more challenging that I had imagined. First, it was just old fashioned enough to be very confusing. My grandmother provided a range of oven temperatures and a range of flour quantities. Second, she was unclear as to which ingredients were added when. I standardized it as best I could and proceeded. In hindsight, it seems to me that one could easily bake this in two layers for a bit less time, but the 8-by-8 inch pan made a nice thick cake that was easy to eat and frost. According to my grandmother’s recipe card, she used a cooked icing on the cake. I stuck with my mother’s standby cream-cheese version, which is ever popular in our house. 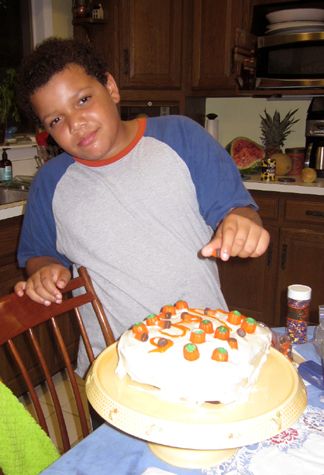 My nephew Michael took charge of decorating the cake. He began with the word “Nana” written in orange lettering. He then went to town with candy corn and sprinkles. At ten, Michael takes the “more is more” school of decorating very seriously. The birthday girl was pleased as punch with the results. Preheat the oven to 350 degrees. Grease and flour an 8-by-8-inch baking pan. Place the chocolate in a small saucepan, and pour the boiling water over it. Stir to dissolve, turning the heat below on very low if necessary. In a mixing bowl cream together the butter and sugar. Beat in the eggs, 1 at a time. Beat in the baking soda. Add the flour and milk alternately, beginning and ending with the flour. Stir in the chocolate mixture, followed by the vanilla. Pour the batter into the prepared pan, and bake until a toothpick inserted into the center comes out clean, about 50 minutes. If you want to be informal and serve the cake out of the pan, that’s just fine. To be a bit more festive, let it cool for 10 minutes and then invert it onto a cooling rack. This entry was posted on Thursday, September 30th, 2010 at 4:00 am	and is filed under Cakes, Pies, and Pastry, My Family. You can follow any responses to this entry through the RSS 2.0 feed. You can leave a response, or trackback from your own site. Michael is to be congratulated on his cake decorating skills!! The cake sounds delicious and your Mum looks fabulous – please give her a (belated) birthday hug from me!! Wow! 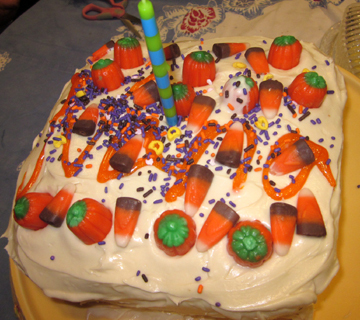 The colorful candy pumpkins and corn–with a blue and green candle, no less– on your cake gave me a happy jolt on this cool, gray fall day in Seattle. Nice work, Michael. Chocolate cake with cream cheese frosting-now that’s comfort food! What a lovely cake, great job Michael! And happy Birthday to your Mom!!! I love candy corn. I will copy this off and bake it! Thank you, and happy birthday to your mother! The old recipes often are very simple, and I’ve found they are just the best! I’ve got one up on the blog I think you’d love to try, Tinky, and talk to your mum about. I firmly believe birthdays are days to forget about weight! My favorite way to ice a cake is with a cream cheese frosting, I think it adds such great flavor and an added tang to the chocolate. And I really loved the picture of your grandmother, what a beautiful lady. Happy birthday to your sweet mama! I have sent along everyone’s wishes both to Michael and to Jan, who had a terrific birthday. Nan, I loved the history of your sponge cake; these heirloom recipes are really something to treasure.